Amos Lee performs during the Farm Aid 2013 concert at Saratoga Performing Arts Center in Saratoga Springs, N.Y., on Saturday, Sept. 21, 2013. 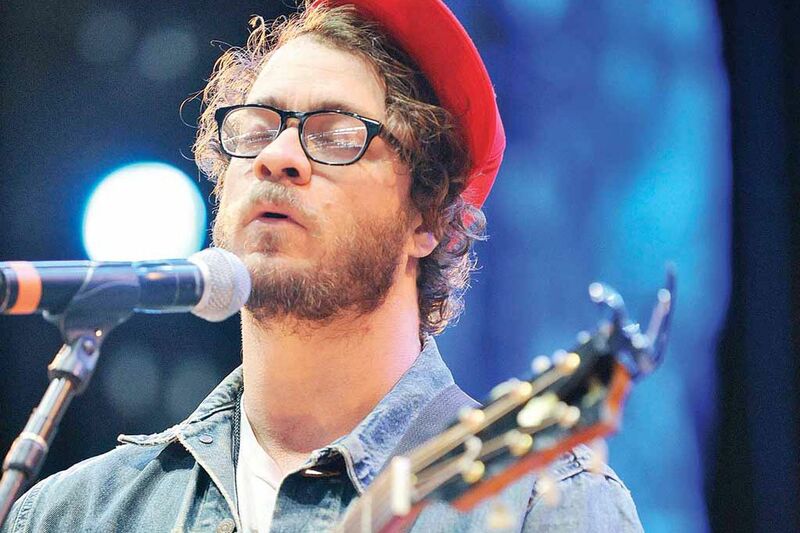 PHILLY-IFIED musician Amos Lee will receive a proclamation from Mayor Nutter tomorrow at 1 p.m.
"My family has roots in South Philly and Kensington," Lee told me via email (he's on vocal rest for his show tomorrow at the Tower Theater). "I have great memories of neighbors and neighborhoods and the intensity that Philadelphia offers. I love it. It's my home. It's my family's home. It's a tremendous honor to be recognized by the city, and I appreciate it greatly." Lee, who lives full time in Philly, recently released his fifth album, "Mountains of Sorrow, Rivers of Song." He's opened for such acts as Adele, Bob Dylan, Elvis Costello, Paul Simon and Jack Johnson. Lee is also an avowed supporter of WXPN Musicians On Call Bedside Performance Programs, in which musicians play for patients in treatment or too sick to leave their hospital beds. During the proclamation, Lee and Nutter should certainly talk tunes, seeing as Nutter has his own musical aptitude. "His 'Rappers Delight' at Fergie's open mic is pretty legit," Lee said. Rapper Meek Mill will be on hand today and tomorrow to hand out turkeys to in-need families for his first Dreamchasers Thanksgiving. The Strawberry Mansion High School alum wants to feed 600 families. The turkeys will benefit such local orgs as Youth Working Together, Town Watch and Unity in the Community. So where can you catch rising star Mill's turkey time? Tonight, the giveaways are at Martin Luther King Jr. Adult Center (2101-35 Cecil B. Moore Ave.) from 5 to 7 p.m. and Hank Gathers Recreation Center (2501-19 W. Diamond St.) from 6 to 8 p.m. Tomorrow, Meek will be at the Vare Recreation Center (2600 Morris St.) from 4 to 6 p.m.
Jane Norman, a/k/a '60s kiddie TV star Pixanne, will return to the stage for a considerably more adult evening, deriving her set list from the Great American Songbook, when she plays Manhattan's 54 Below on Dec. 19. This is Norman's first New York cabaret show. Not wanting to leave her Philly fans out in the cold, Norman is giving locals a ride to the show, by chartering a private bus to NYC. Norman, who speaks with the sweet sprightliness of her TV alter ego, says she still gets recognized all the time from her WCAU show that ran from 1960 to '69. Even her "babies" from the kindergarten class she taught at Elkins Park's Shoemaker School still have a place in their heart for the effervescent Norman. "About two years ago, I got an email from one of my 5-year-olds," Norman said about her former kindergarten pupils (who will always be her babies). "They're 50 now. How can that be when I'm only 25?" Norman got a huge shock recently while on vacation in San Francisco, when she happened to notice that one of her 5-year-olds was headlining San Fran's prestigious Fairmont Hotel. "I remembered sending a note home to this student's mother, telling him to give him piano lessons," Norman said. "He recognized me and brought me up onstage and told the audience, 'This is the woman who made me what I am.' " The former student insisted Norma sing along with him. "We entertained for 20 minutes!" she said. A spot on Norman's bus is $50, including entry to the show. For more info, go to pixanne.com. * Pixanne isn't the only Philly face gracing the 54 Below stage in December. Peggy King and the All-Star Jazz Trio - pianist Andy Kahn, drummer Bruce Klauber and bassist Bruce Kaminsky - will be at the venue Dec. 30. Can't make it? Get a sneak peek at the act at the Ethical Society of Philadelphia (1906 S. Rittenhouse Square) on Sunday at 3 p.m. Get tickets at icondv.com. Champ Eddie Alvarez will celebrate his reclamation of the Bellator MMA lightweight championship tomorrow at Dave & Buster's (325 N. Columbus Blvd.) from 6 to 9 p.m. The party is free, and the first 50 guests will get some sweet freebies. Tonight at 10 p.m., former West Chester resident Paul Matthews will fight co-worker Alan Lu on the Esquire Network's "White Collar Brawlers," where office drones get out from behind their cubicle walls and take it to the ring.